People use lazy stereotypes to compare Paul Pogba to players like Patrick Vieira – tall, strong, fast, athletic – but his superb passing, vision and creativity are a massively underrated side of his game. 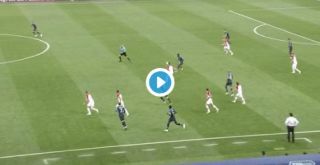 Just watch the video below as Pogba’s incredible volleyed long ball finds Kylian Mbappe on the right-hand side before the ball eventually finds its way to the Manchester United midfielder to score France’s third. Pogba started the move deep in his own half with a moment of immense quality that would have more people purring had it been the likes of Andrea Pirlo, Zinedine Zidane or Paul Scholes. But this deserves a video clip of its own as Pogba’s moment of magic releases Mbappe to eventually allow Les Bleus to score a crucial goal to make it 3-1 against Croatia on their way to World Cup victory.